Exactly, they changed the format of the name to capitals, there shouldn't be an issue, but there is. We tried a petiton to the government to clamp down on it, but it turns out they are on there side, oh well. Twitchy is almost paid off and that's going to free up a lot of money to put towards a Mini. Here's the thing, I want to race it in the SCCA, so I don't really want to spend a whole lot on the car, it doesn't have to be the prettiest mini out there but a strong motor and RHD is important to me. Could I find one for between $2-4k? I'm ok with importing it from the UK if needed. Is my dream possible?? Also, how much would it cost to throw a roll cage in a classic??? Hey, who bought Dingo last?? Is he up for sale again? Description: UK-made Safety Devices bolt-in roll cage, less diagonal bar. This bar with support tubes to the rear wheel wells is a good safety addition for street use and is required by most race organizers. Use in addition to C-STR237SD front cage for race applications. See also C-STR238SD door bars. Description: Safety Devices is one of UK's main roll bar manufacturers. This front cage is designed to be used with C-STR47SD rear cage, sold separately. Must ship by truck. Yeah, I've gotten a similar answer from someone that has already installed one. He learned how to weld just to do it so he did most of the work and it still cost him $3000-$3500, and he said it was an event! I might be able to find a good old boy around here that might be able to do it. I know a lot of rednecks with big trucks, I'm sure somebody knows a welder somewhere! Oh west cost 2010 for me. Just FYI, the Mini Mania Website has a great list of cars for sale across the country. Sources of information to read, books, websites, etc. Who locally (Jacksonville area) works on classic mini's (since I am "Tim the Tool-Man Taylor as my friends would say). People who've been there and like to help newbies with suggestions, things to consider, maybe a list/process to follow. You've got a great local source for hands on help with Bobbie! He did some great work for me on Dingo and has always been very helpful with his vast Mini knowledge. Thanks, you were correct - Bobbie and I spoke and he is currently reviewing a car I am interested in. I saw a classic yesterday. Red and white, though could have been red and silver. Had the 4 spotlights and sportspack. Had Y reg UK plates front and rear to suggest it was a 2001 registration. I understand that it need to be a pre 1972 car to imported but how was this done!? I mean it's a 10 year old car pretending to be older. If the UK plates are original and the fact that it has airbags show it's not old! How is this car here?! Loved it BTW. moonloop wrote: I saw a classic yesterday. Red and white, though could have been red and silver. Had the 4 spotlights and sportspack. Had Y reg UK plates front and rear to suggest it was a 2001 registration. I'm sure what you saw was a legally imported car that had been painstakingly restored to resemble a newer car, right down to the very last bolt. As you state, it would be against the law to import a car newer than legally allowed. I would never entertain the thought that some unscrupulous scofflaw would take a newer car and change the VIN tag to make a newer car have an older VIN and logbook, making it look like it's an older car for importation purposes. I mean, Mini owners are all law abiding citizens, don't you think? 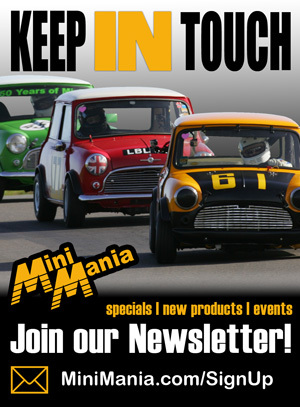 Of course, all mini owners abide by the letter of the law! Just found it odd that whoever checks out what is being imported doesn't find it odd that a car that is supposedly from the 70s has multi point ignition and airbags! I have owned 2 classics in the UK and would love one here! Law or not, I think it's awesome that there are such 'loopholes'! I understand that it need to be a pre 1972 car to imported but how was this done!? from Hemmings Sports & Exotic Car, Feb 12 issue - here's "some of the more interesting cars now eligibe for import to the USA"